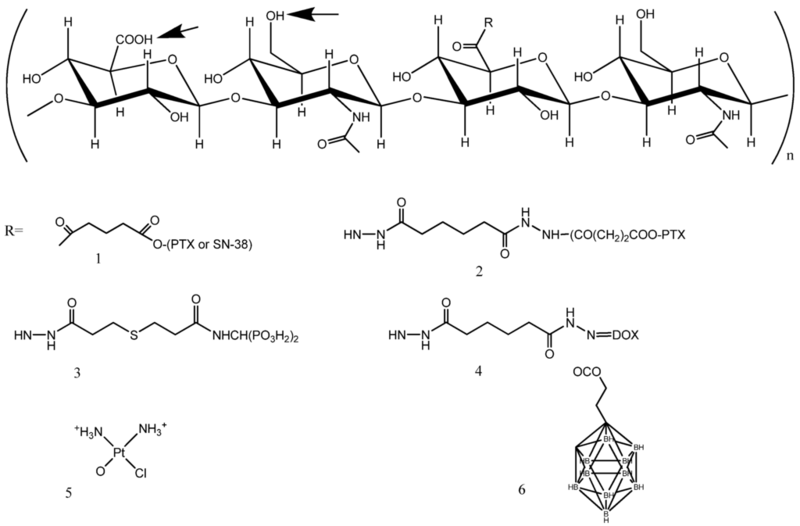 Hyaluronic acid is a high molecular weight (106 –107 Da) glycosaminoglycan polymer composed of repeating disaccharides: ?1,3 N-acetyl glucosaminyl-? 1,4 glucuronide. HA is ubiquitous, being the main component of extracellular matrix, and is essential for proper cell growth, structural stability of organs, and tissue organization. 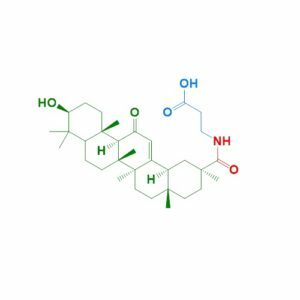 From the pharmaceutical standpoint, HA is a promising component, because it is biodegradable, biocompatible, nontoxic, hydrophilic, and nonimmunogenic. HA contains several chemical groups to which other components can be conjugated. The carboxylate on the glucuronic acid, the N-acetylglucosamine hydroxyl, and the reducing termination, have all been successfully utilized in conjugation reactions with drugs. The acetyl group may be enzymatically removed from the N-acetylglucosamine, and is thus also a potential site for drug conjugation. Low levels of the hyaluronic acid receptor CD44 are found on the surface of epithelial, hematopoietic, and neuronal cells; it is overexpressed in many cancer cells, and in particular in tumor-initiating cells. HA has recently attracted considerable interest in the field of developing drug delivery systems, having been used, as such or encapsulated in different types of nanoassembly, as ligand to prepare nano-platforms for actively targeting drugs, genes, and diagnostic agents. This review describes recent progress made with the several chemical strategies adopted to synthesize conjugates and prepare novel delivery systems with improved behaviors.